Anthony M Day “Ant” or “Finny” as he was known by family and friends, went to live with Jesus on October 25th, 2018. Anthony was born on August 4th, 1978. Anthony is preceded in death by his Father, Dale William Day, paternal Grandparents, Annie Lee Day and John Alcus Day, a Sister Frances Day, and maternal Grandmother Barbara J Geer. 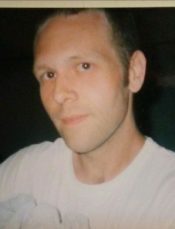 Anthony is survived by his Son, Anthony Day Jr., maternal Grandfather, Fred B. Geer, Mother, Sandra Geer, Brothers, Daniel Bishop Day and Dale William Day Jr. , Sister, Tracy Leigh Burgess (Jonathon), and many more Aunts Uncles, Cousins, Nieces and Nephews who loved him dearly and will miss him greatly. Nearest and dearest to Anthony was his son. He said the day Tony was born, his life began. Ant had a tender heart, and at times was the most caring, loving, soul anyone could hope to know. Anthony loved taking walks in the woods, and fishing when he got a chance. He was a Simple Man, not into technology like the rest of us have grown accustomed to. His natural ability to work with his hands and his love of horticulture allowed him to grow almost anything. He planted a garden in his Pawpaw’s back yard and tended several others throughout his adult life. One passion that carried over from his youth was picking flowers. Wild flowers were his favorite as he would always bring a bouquet of flowers to his Memaw, every time he would visit her. Though we will forever miss our “Ant” this side of heaven, he lives on in the hearts of family and friends until we see him again. Visitation begins at 1:00 pm on October 29th at Pensacola Memorial Gardens, with memorial and internment immediately following. Pallbearers are Geoff Geer, Jarred Geer, Jonathan Burgess, Jay Harding, Daniel Day, and Brad Gardner. My sweet boy you will be missed. I hope to see you again one day. My prayers are with Sandy ( my best friend for 30+ yrs) and all the family and friends. Love you Finny. Can’t believe you are gone from this earth in this life. I hope to see you again one day in what some people call heaven. I know you’re still here in spirit. Xoxo until we meet again some day. Everything changed the day Anthony came into this world, bright smiles, laughter, first words, first steps though I toted him every chance I got. Life moved quickly. He was a boy going fishing or playing ball, then a teen chasing dreams, making friends from Jax, Florida to Albany,Georgia to Pensacola and most places inbetween. He was a young man with strong beliefs, unwavering opinions about everything, and loved a good prank–creating more of that laughter. He got his heart stole a couple times but, he chose to give most of his heart to his son. The plans he had are now ours to fulfill. Everything changed the day Anthony left this world. I’ll love him always! When I met Anthony he was into the “smashing pumpkins” alturnitive rock group and art. I’ve loved him and all our family before and will always love him. When he was away we wrote to each other and foremost on his mind was always Tony. He was a gentleman, and a man who had a heart full of love for his son. I’m so sorry Tony won’t get to have his dad or see him until he gets heaven. But Tony did get to grow up knowing that his daddy loved him so very much! That He was indeed his world!